Coming back to the topic, I would like to underline this: ok, there isn't an absolute relationship between old/new release but... even if with a 5.2.8 based there are no problem, on the other hand with the latest official release (5.4.3, both types normal and retro) there is again. Then, maybe, it could be wise to insert a little adjustment in future releases, like "something" as little delay or wait state, in order to avoid this problem or similar. Maybe it's not a so wide problem but I've found that I'm not the only one who seen it. However, I'm going to send the thin client + usb external cd drive to a friend, because "it isn't enough" for my purposes (-> to see movies as streaming on web, in full screen tv and, to speak frankly I would like very much to know what are the minimum hw requirement for this, in term of cpu/ram/graphic...). Then, if there will be need of further tests, please tell me because I will have no longer the hw to perform them in a couple of days. Out of curiosity there is one final test that you could perhaps perform. When the system did boot with the USB stick (containing the duplicate main sfs file) it is not clear which sfs the system found – i.e. the one on the stick or the one on the CD. If you could first rename the sfs on the stick to XXXpuppy_lxpup_12.sfs and then try again. If the system boots, it will prove that the one on the CD is being found and that the very act of plugging in a stick with files to be searched, introduced sufficient delay for puppy to find the main sfs on the CD. If it does not boot the placement of the main sfs on the stick was the key to success. Finally you may want to post your H/W query in another more suitable thread. Maybe I'm able to answer directly... I think it looks at the sfs file on the USB stick. I say this because at shutdown it asked me about the save file and it pointed to USB stick. I regret not. It would do that in either case. 1. Download and install the pet. It has libsoup-gnome plus patches for the Help in MtPaint and Gnumeric. 2. Edit /usr/share/applications/Seamonkey.desktop (Seamonkey Web Browser). Two changes are needed--change the Exec and Categories keys as indicated. Adding %U means accept a url argument; For some reason PPM seems to strip it off--hence the manual approach. Changing the Category from X-Internet to WebBrowser means that Seamonkey will show up in Preferred Applications. Right-click the file and Text Editor to Edit. 3. 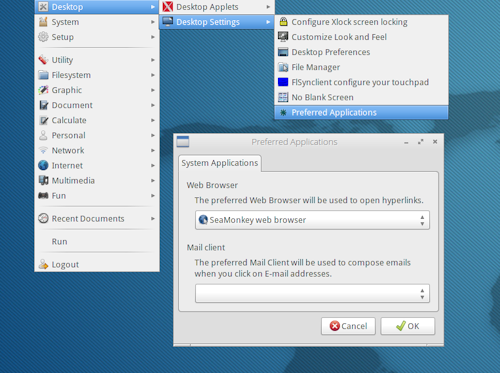 Open Desktop -> Desktop Settings -> Preferred Applications and select Seamonkey Web Browser. Help will work in Abiword and most programs. About links will also work from Help -> About in most programs. Thank you to everyone who participated, I learned a lot. Would it be possible for you to add a waitdev boot param to Lxpup? I don't know how to do this ? enjoying lxpup ! nice work ! You can use the Pemasu's sfs. Posted: Wed 30 Jan 2013, 11:58 Post subject: Is this becomming a team efford ? I have not read the whole thread, but I was surprized to see Playdays join in. After Larry's succes of perfecting Lucid (still use it every day) and Jeromes energy and excelent initial work, LxPup could very well become the new Puppy generation. I have always been puzzled why Lubuntu (Abiword, Gnumeric, Chromium) is 690Mb in size (even before a 190Mb live update). sorry i should have been more specific i also needed the md5 sum for the lxpup 12.12 iso file to verify my download not on website didnt see it in this forum just the one for playdayz remaster i was looking for md5 of jejy69 12.12 lxpup but also thanks for all the info so far jejy69 & peebee lxpup really smokin ! Fortunately, you've seen this error. For devx sfs, follow the Peebee's link. Thanks for this point of view, but I do not think lxpup, may one day become the new Puppy generation. However, Puppy might well be adopted LXDE as a new desktop environment ? Is this the plan ? I confess that I do not thinking long term, but Why not ? But I think projects like Archpup or Carolina, will get a higher status than Lxpup. I hope not to disappoint, but the next version will be based on Slacko 5.4. I also leave Gnome 3.x, which is becoming increasingly difficult to operate. I can not start Gnome 3.6. Maybe Gnome 4.0? LxPup could very well become the new Puppy generation. Is this the plan ? There is no plan Volhout. I am a fan of Lxpup and Jejy69. I think Lxpup is a great Puppy because it has good usability, a modern look and feel, and a working recycle bin. I am glad I was able to figure out how to get the Help working but I have a heavy load and won't be able to do much more. I hope Jejy69 will continue and I hope testers and developers will help him. Thanks for your package ! Today, I happen to have gnumeric 1.12 complete ( all plugins ) with functional assistance! Full Abiword 2.9.4 ( all plugins ) with Gtk3, and working help. But package is big... Approximately 17mo.